It’s 25 years since the Tobacco Factory building was saved from demolition and brought back to life, repurposed as a creative and social hub for the community. The building was originally part of a huge Victorian factory complex which had been derelict since the mid 1980s, when Imperial Tobacco relocated to Hartcliffe. When no future uses of the site were found, all the buildings were scheduled for demolition. But, in 1994, George Ferguson stepped in to save the Franklyn Davy building on the corner of North Street and Raleigh Road. While the surrounding buildings were sadly demolished, he set about developing plans which led to the vibrant mixed building it is today. You can read all about the history of the building here. Extensive renovation works took place (1994 – 2000) with various pop-up events occurring in the building, including theatre shows. The Cafe Bar opened in 2001 and since then a whole lot more has happened. 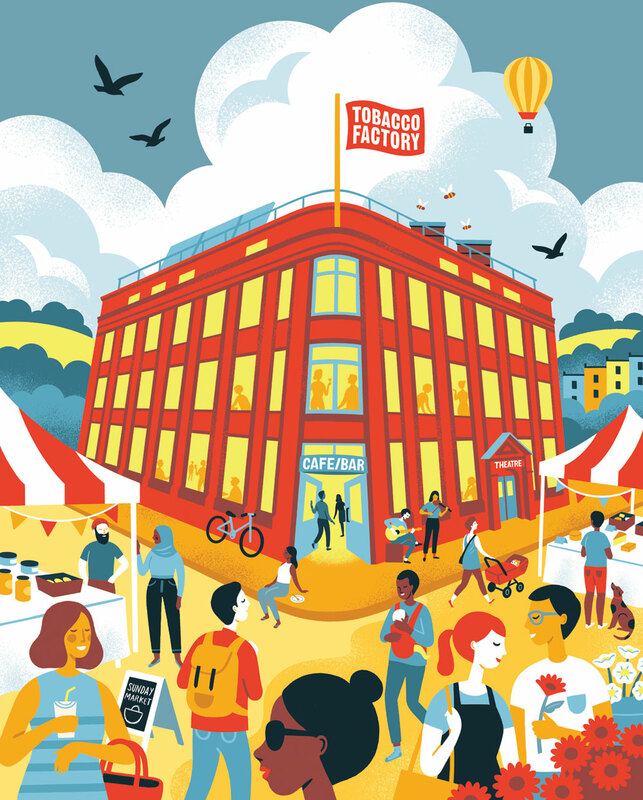 Over the weekend of 25 & 26 May, we’re going to celebrating all the many things that make up the diverse aspects of Tobacco Factory – from theatre shows to Upfest. Here is an outline of the event that we have in store for you. We hope you’ll join us for a big ol’ celebration of all things Tobacco Factory! Bristol is renowned for its contemporary circus companies and we’ve had circus acts at many of our events. Join in with one of the afternoon workshops learning aerial circus skills (limited places) and watch out for pop-up performances. We’ve been one of Upfest’s key venues since its inception in 2008. Upfest is taking a break this year, but to celebrate the amazing world of street art, they’ve hand-picked local artists to paint the boards around our Yard. We’ve been part of the street food phenomenon over recent years and we invite some of Bristol’s best to serve up their finest dishes, including Low n Slow, For Mice And Men & Gopal’s Curry Shack. Joining the dots between soul, disco, house, boogie and 80s jams we’ve DJs Dirty Casino, Toddywork, Waxmouse and Kiia B2B LMR. We’ve commissioned a bespoke moving image piece by Limbic Cinema which will be mapped onto the rear wall of our building to be viewed from The Yard as the sun sets. Artworks that feature or have been inspired by Tobacco Factory. More info here. Our friends and neighbours, Bristol Beer Factory, bring their magnificent array of award-winning beers to our pumps for the whole weekend and they’ll be launching two new beers. Bringing the day to a crescendo with irresistible afrobeat. Plus, DJ Paulo Fernandez. How has Tobacco Factory been part of your life over the last 25 years? Share your favourite experiences in our memory box (located in the Cafe Bar). We’ll add these to our memory wall throughout the weekend. The fascinating story of the Tobacco Factory building, told with photos and objects, from its opening in 1912, the renovation and up to present day. Memories from casts and staff of past theatre shows and how the theatre evolved. Featuring pop songs from the 60’s and 90’s. Dik Downey & the Big Bad Wolf and Steve Wright Puppets do mad-cap puppetry – plus pop-ups around the building. Our Sunday Market launched in 2004, initially monthly and later weekly. It’s grown to become one of the best community markets in the city, with a strong following. At the end of every month we’ve an emphasis on local food and drink producers. On the 10th anniversary of the market (2014) we closed a section of Raleigh Road so the market could spill out into the street, complete with a pop-up ‘village green’. We’ll be laying out tables and benches down the middle of Raleigh Road, so you can bring ‘n’ share food and drink with friends and family – and make some new pals too. Soundtracking the banquet will be uplifting jazz from the Bristol Community Big Band and heartfelt songs by Willow. Plus, DJ Pete (Amber Green Records) playing the finest records from the past 50 years. Spinning outer world sounds we’ve DJs Owain K, Gilbert and Leewok. Raucous live swing band & dancers.